UPDATED: FEB 28, 2019 Love this beer and I'm not even a beer drinker. Light, clean & refreshing. Drink ultra cold! UPDATED: DEC 26, 2018 Puszka 950 ml. Pamiętam, że kompletnie bez charakteru, mało słodowe i wodniste. 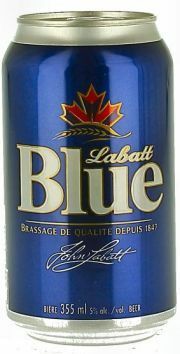 UPDATED: DEC 4, 2018 Once upon a time, before I started being adventurous in beer, I thought the beer itself was blue. I mean, the name...hello.Pours a light golden straw color. One finger white head that is like a plug, good lasting. Good lacing. Nice clumpy chunks hold up well. Has odd sediment and stuff that I originally thought was carbonation. It’s not blue.Aroma is malts. Light spicy hops.Taste is malty and sweet, light peppery finish.Mouthfeel is light bodied. Slightly chewy. I keep feeling sediment in my teeth.Overall it’s not great. Sort of your average beer. Glad I tried it, but no need to buy it again. Pretty good beer, not the greatest I've had. But overall pretty tasty, not sure how beer snobs compare this to a IPA or along those lines like comparing Apple's and oranges. It's aroma I didn't smell anything. Taste like a beer to me, strong flavor, went down smooth slight carbonation, no aftertaste. Just a beer, overall I'd buy again, some of the reviews take with a grain of salt, these guys writing them wear skinny jeans and carry a man purse. If you like beer, it's not bad. UPDATED: SEP 22, 2018 Purchased from my local BevMo. Thick white head on top of a clear golden body. It smells of malts with a hint of metal. Bland and flavorless even for a new world pale lager. It's not gross or off putting, but unremarkable would be an understatement.